When Hollywood takes on a political issue, you can’t expect a nuanced treatment. Still, as a journalist who has followed gas-drilling controversies in Pennsylvania and the Rocky Mountain West, I was hoping for better from Promised Land, the recently released movie about the evils that await rural communities when the gas companies show up. Set in a fictional Pennsylvania town, filmed outside Pittsburgh, and starring Matt Damon, the movie portrays gas drilling as a Faustian bargain that families and communities should reject. And it shows gas companies using unethical tactics to get their way. For dramatic purposes, Promised Land overplays the companies’ purported sleaziness while touching lightly on more legitimate concerns about gas drilling. The truth is that the natural-gas industry doesn’t need to resort to the kind of underhanded behavior presented in the film. It can achieve the same ends by opening up the corporate checkbook for goodwill-building expenditures, promising big money for roads, schools, and community causes. And if a gas company were inclined to use get-tough tactics, as I saw Evergreen Resources do in Colorado in the mid-2000s, it would be more likely to hit local opponents who dare to speak up with expensive lawsuits, a tactic known as “SLAPP” (strategic lawsuits against public participation). Or it could take advantage of the Supreme Court’s Citizens United ruling and simply buy the necessary political support – for example, by creating an “independent” campaign front group to pour money into electing sympathetic township or county officials. When you first look at one of J Henry Fair’s photographs, you’re not sure what you’re seeing. In one, a big splotch of white bleeds into a wide expanse of luminous, deepening green colors. Etched throughout with wavy rivulets, it looks like a detail from a Georgia O’Keeffe flower painting. Often there is no clue, except in the photo’s title and caption, that the particular work of art has a dual purpose: It is also powerful evidence of the industrial insults being inflicted on the Earth. 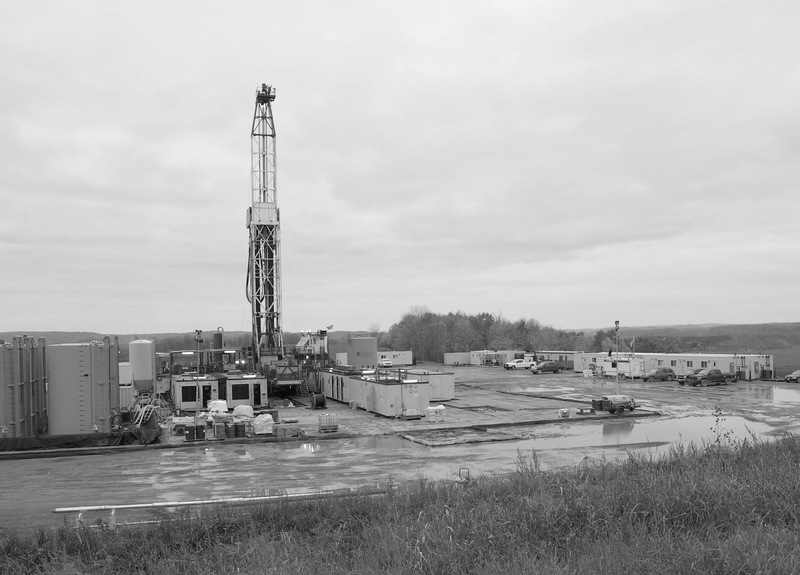 Shale rig, Tioga County, Pa. Standing in Chip Hollister’s front yard on a Saturday night, you could hear a whoosh, a short roar, and then a brief silence before the cycle repeated. Whoosh. Roar. Then quiet. An orange glow flashed across the night’s low cloud cover, then faded, then flashed again. Again and again: Whoosh. Roar. Quiet. Flash. Hollister bought his mid-1800s farmhouse and a patch of what used to be quiet rural land in western Bradford County nearly 40 years ago. Today he’s on the front lines of Pennsylvania’s shale gas boom, and he’s not happy about it. Before moving back to Phillies land last year, I had spent 30 years in Alaska, where I could drive along that wilderness state’s sparse collection of highways and roads, totally distracted by beautiful scenery, ignorant of important commercial messages and urgent social causes. Now that I’m back here in civilization, in Pennsylvania, driving in blissful ignorance is not a problem because, unlike Alaska, Pennsylvania has billboards. On a recent trip along the Pennsylvania Turnpike, I was able to further my education considerably, both as a citizen and a consumer. Inspecting cars for safety was a Bolshevik concept in libertarian Alaska. If you wanted to keep driving a one-eyed monster that had a bad night in a weekend demolition derby, the state didn’t care. You could get your renewal tags and be on your way. The state would no sooner check cars for safety than check your sled-dog team for worms. Until it was time to get my car inspected, that is. Newly released e-mails show her image obsession. I followed Palin’s governorship as a journalist for the Anchorage Daily News, and I’ve read many of the e-mails. What I see in them, however, is not a governor deeply engaged in governing Alaska, but a governor deeply engaged in sending a constant stream of e-mails.